One-dimensional vanadium oxides with desired physical and chemical properties have attracted great attentions in nanoelectronics, nanooptoelectronics and energy storage and so on. Here we controllably synthesized size-tunable dandelion-like vanadium oxides through a flexible microemulsion approach. The detailed assembly process of the vanadium oxides nano-dandelion was investigated by controlling the reactant concentration and aging time. 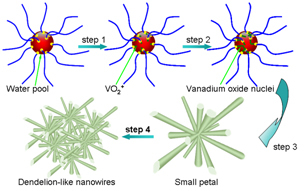 The nano-dandelions were composed of vanadium oxides nanorods with small size. The self-orgnizational structure can be changed from dandelion-like structure to side-by-side alignment and bunchy-like structure. Such novel vanadium oxide nano-dandelions show good photoluminescence property and may have great potential application in luminescence and other fields.